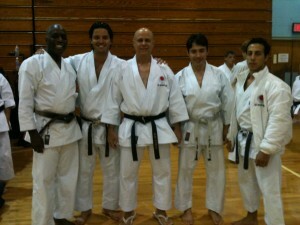 Thank you Sensei Andre for visiting with us and for the awesome instruction! 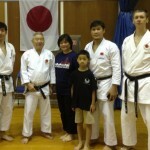 Thanks for embracing our JKA community, your encouragement and inspiring advice but most of all, for extending your friendship to us. 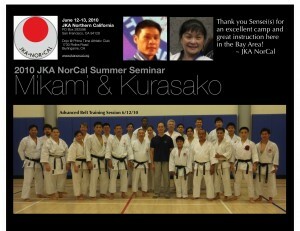 Thank you Sensei Mikami and Sensei Kobayashi for an awesome camp! Thank you Mickey for BBQ! Instructors-keep practicing and improving your skill; your students rely on you and learn from your example. Examiners-determine the proper rank level for your students; take care of their development and mindful not to “break their spirit”. 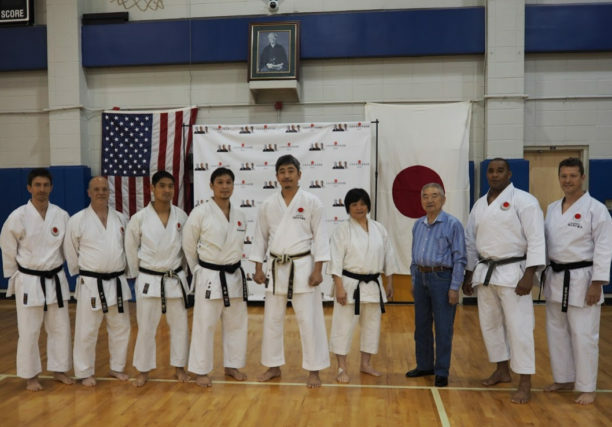 (6/4/11) Sensei Mikami credits Sensei Kobayashi for having one of the leading university clubs – being able to preserve the traditional budo of karate as well as successful using modern methods of training. 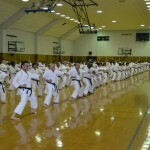 Sensei encouraged us to develop our “best or favorite technique” (TOKUI WAZA). 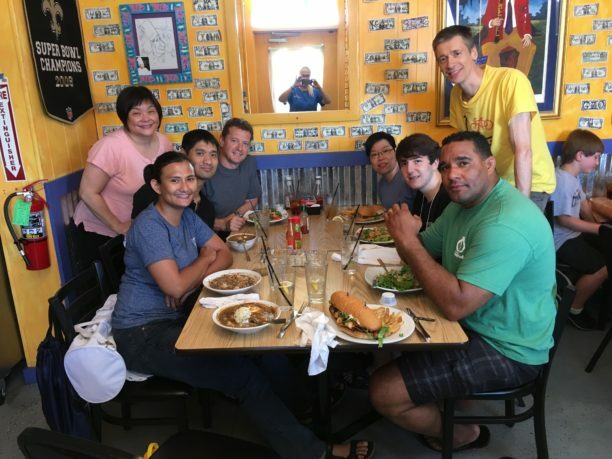 Explore what works for us, develop our strength … and take time to litmus test our technique, benchmark by challenging ourselves at tournaments once in a while. It will certainly be part of our journey and discovery with martial arts. Kobayashi Sensei reminds us not to use our lower body to generate power and display large movements – performing a more dynamic form. There are prescribed rhythm to JKA katas and we should strive to follow it – not invent our own. Aspire for precision. In kata, we are our own competitor. 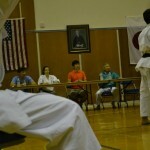 JUDGE’S TEST: Sensei Kobayashi being the General Manager of JKA’s Qualifications Division was truly inspirational here. He demanded a high standard for accuracy, transparency in decision, assuredness and confidence in making calls/decisions and most importantly ensuring the well-being of the competitor – it is the “Spirit of Judging” (responsibility of judges). He asserts that “a competition is good only if there are good judging skills”; “it should be about the competitors”. 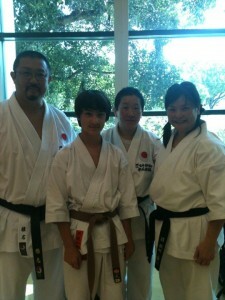 Sensei took time to critique, correct and explain proper etiquette, gestures, best practices and decision process. “Be decisive – indecision masks the efforts of the competitor”. We all learnt so much – even those of us watching by the side lines. There are 3 elements in executing KIME – (1) Target (2) Speed (3) Concentration. Every move should be delivered with kime. 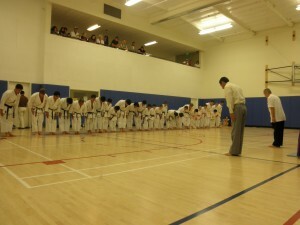 Sensei Mikami started the class with a series of warm-up drills focusing on basic Kihon techniques and discipline. And then he went onto reiterate from yesterday how important “posture” is as well for Kumite (sparring). He reminded that most of us tend to be a little too high on our stances which limits our ability to react or initiate attack. He recommends we keep our ‘center of gravity’ low to the ground for better stability and increased flexibility for varying distance by adjusting shorter or longer stances to reach opponent. Not one hard fast rule in kumite – need more practice to use judgement against many different opponents. Today, Mikami Sensei reviewed “sweeping” technique with the class. Sensei called out that “getting the opponent to fall to the ground” is NOT THE ONLY REASON to use “sweep”. It is also effective just to “get opponent off balance” thereby creating an opening for a follow-up technique; an effective “feint” to create an opening; or disrupt the opponent’s concentration to create an opening. It is important to practice where to place the sweeping foot – not too high,closer toward the ankle. Also the direction of sweep with hip action will determine effectiveness in execution. Kobayashi Sensei piled onto the theme, reviewing Kihon – he observed that many of us waste alot of energy during our movement from one stance to another – alot of up and down movement. He reminded us that we should aspire to keep our height constant throughout our movement and preferably “low center of gravity” with good posture. He showed us an exercise how we tuck our legs under us with knees bent and explode to the next stance paying attention not to “hop up and down”. Even when he broke it down for us – not an easy task (though his demo looks effortless), certainly worth investing with practice. 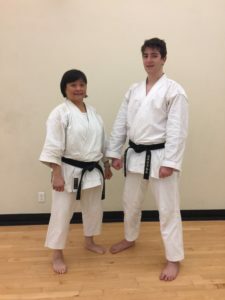 He progressed to 5-step basic sparring citing good kihon techniques as a foundation, and called out that on the defense, a good “counter attack” has to be deliberate and with forward momentum to be convincing. I’m guessing, “not a happenstance, knee-jerk reaction by sticking out a limb with our posture leaning backward just to end the series!” (my pigeon interpretation of his msg delivered in Japanese mind you). To practice the forward momentum counter attack, he modified the 1-step sparring counter to add-on a “kiri-kai” step in oizuki. For example, a jodan punch will respond with an age-uke rising block and quick follow-up by switch legs step forward punch vs the usual reverse punch counter. Pay extra attention to vary your step back according to your opponent in order to execute a strong finish with a step in punch technique. We had many rounds of rotation with varied partners focusing on a deliberate block and fast follow-up (possibly “go-no-sen”). Toward the end, he challenged us to build up speed on the counter, almost blocking in mid-movement focusing on ending with the step in technique “as one motion”. Sorta pre-empting the attack with speed of counter (edging toward “sen-no-sen”). Excellent class! very stimulating, gives fodder to how we can practice these very effective kumite techniques using 5-step and 1-step sparring exercises. 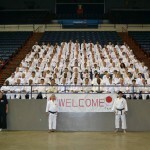 A testament to world class JKA instruction! Kobayashi Sensei was as passionate in Kata instruction. Here are some of his teachable point-of-view (TPOV) on this discipline. Besides good posture and good form (a foundational mandate), there should be “kime” (focus) on every move in the kata – executing with maximum speed, power and finish (almost like katas within the kata). He observed that there is too much use of upper body and upper body strength (making us look very tense and sluggish in our movements) – the key is to utilize lower body and stability of stances to generate power and speed of each move. The upper body will follow and provide the “finish” of the kata. We need to pay close attention when shifting from stance to stance – show the intended weight distribution of each stance in the kata. Of course, all the while keeping good posture with your center axis and a low center of gravity with stances. 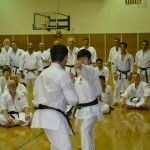 When first learning a kata, or teaching it – it is like a “textbook kata” just working on the form (kata). But we should aspire to reach for a higher level of performance, injecting “kime” in every move; using all muscles in your body to move with speed and explosion in your transitions; varying the rhythm of the kata emphasizing the slow and fast movements (showing good control), in essence injecting “spirit” in the kata. Your kata should be “ALIVE”! Sensei encourages us to strive for this in all our katas, he called out that Bassai-Dai has 42 moves in all, and Kanku-Dai has 65 moves (the longest kata in our JKA curriculum) lots of stamina, lots of practice … GAMBATTE (keep trying your best!). (6/2/11) A long day of travel, leaving the home early this morning at 54 degrees and landing in New Orleans at 96 degrees with high humidity. Made it just in the nick of time for 1st class (6pm-8pm) heading straight from the airport in our rental car. Thanks U.N.O. for an air-conditioned gym at the Human Performance Center. 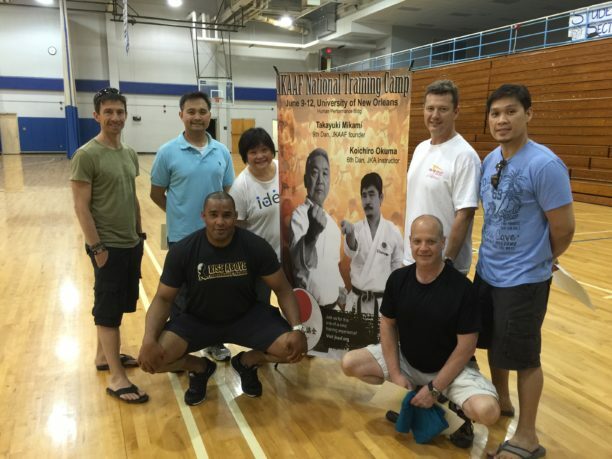 It was great to reunite with friends at this event – where many dojo members come together to train and learn from each other. 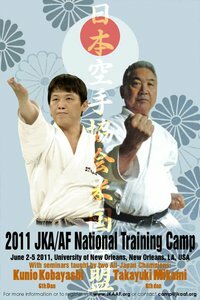 Also, a wonderful opportunity Sensei Mikami presents to JKA/AF karate-kas to be able to train under the many notable JKA instructors. 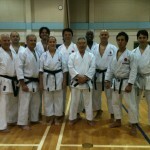 Sensei Mikami kicked off the event with a regiment of warm-up drills. 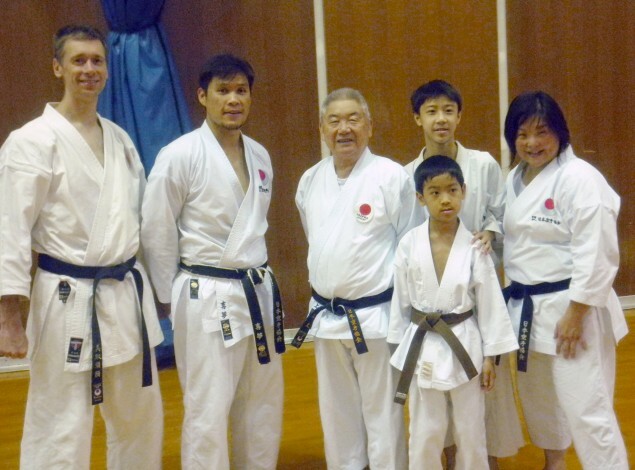 Then Sensei Kobayashi reviewed KATA beginning with Heian Nidan. For a tall man, he has beautiful low stances! He emphasized the important of posture and preserving the central axis even when transitioning through moves. He illustrated the point demonstrating on the 1st move of Heian Nidan – how we should begin by bending our knees to get into a back stance keeping our spine straight instead of the tendency to propel our weight and upper body towards our hand technique. He had the class do a partner exercise where we are hip to hip, side by side ‘flanking each other” as we sink to a back stance “joined at the hip”. He also called out the “gyaku-hamni” block to make sure our shoulder position is distinguished by a 45 degree angle in order to deflect oncoming attack (much akin to blocking position in Bassai-Dai just before the first kiai). 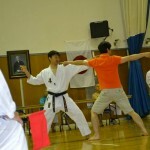 Then the follow-up “gyaku-zuki” after the kick should be a forward momentum toward the target instead of many who drop into the technique (hi-low). 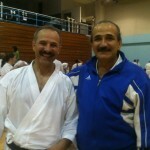 We also reviewed Heian Sandan and Heian Yondan. He talked about how our head position is critical in setting the stage for good posture – how when misaligned veers our weight off our central axis. Additionally, the importance of using all our muscles in “balance” – a foundation for good posture and stance. For example, the front stance supporting leg has to engage the top of the leg, outside thigh, inside thigh and back of leg equally balanced, else the stance would be skewed. Also the first move of Heian Sandan – do not forget to squeeze your shoulder blades and use the back muscles for power using “expansion and contraction” to exert “explosive” techniques. Brothers? Certainly in "spirit" - glad to reconvene and train together. Sensei Kobayashi also contrasted Heian Yondan to Heian Nidan first moves as training how to be versatile and control our movements for fast explosive and slow controlled. He reminded us to work on the control movements – paying attention to landing our techniques at the same time, even the slow movements. 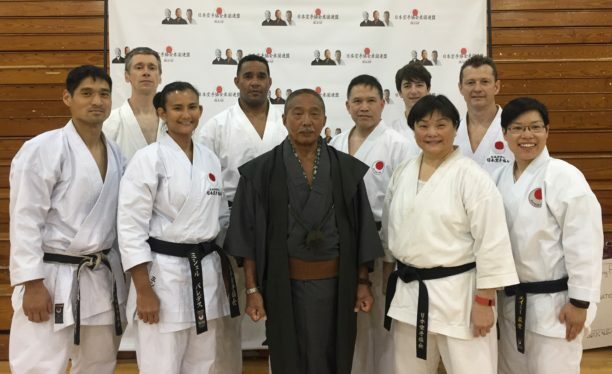 Finally, Sensei Mikami invited a few volunteers to demonstrate a few bouts of “kumite” – taking the opportunity to discuss with the class on best practices and distinction of shotokan and JKA techniques – “free feedback and critique”! Phew, what a first class! I am tired but certainly looking forward for tomorrow bright and early (7am-9am). But first, some Jambalaya at ACME’s as a reward. OSU! 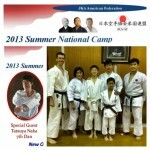 Sensei Shiina returns to the US in Miami, FL for an encore awesome karate camp! Come for the week, or come for the weekend – you will not regret it! Only U$150 (flat rate) … what a deal! 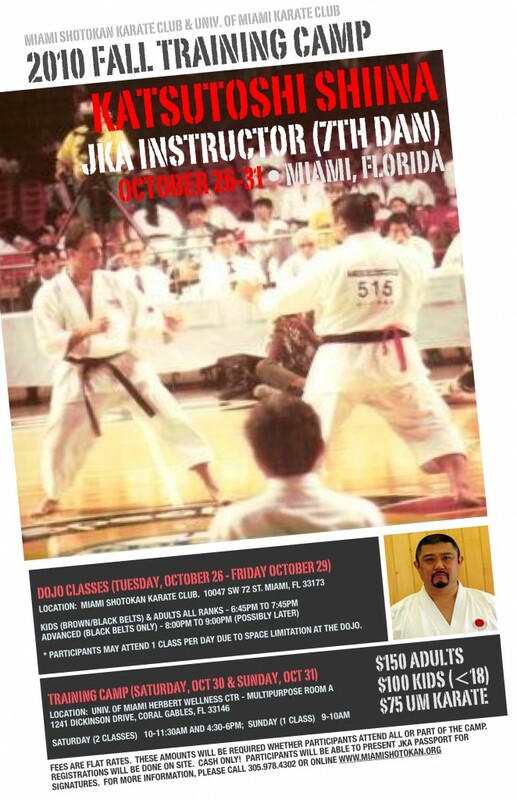 Train with Miami Shotokan Karate Club, with Sensei Jose Ferrand who is hosting and bringing to us “world class” karate instruction. Don’t miss out on this exciting event. Sensei Shiina arrives a little early before the first class with his wife Mrs. Shiina. 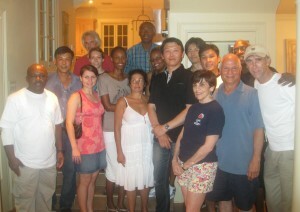 You truly feel his presence, heartfelt friendliness and a sense of familiarity to be back at the Miami dojo. His enthusiasm and spirit is infectious … you feel compelled to respond in kind, or more accurately a “knee-jerk” reaction to his deep bellowing count! 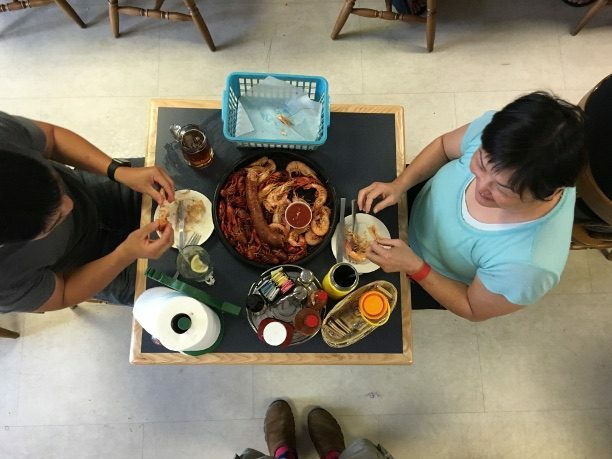 He tried to set everyone at ease, this being the first day- he encouraged students to ask more questions and relax, to warm up for the rest of the week. 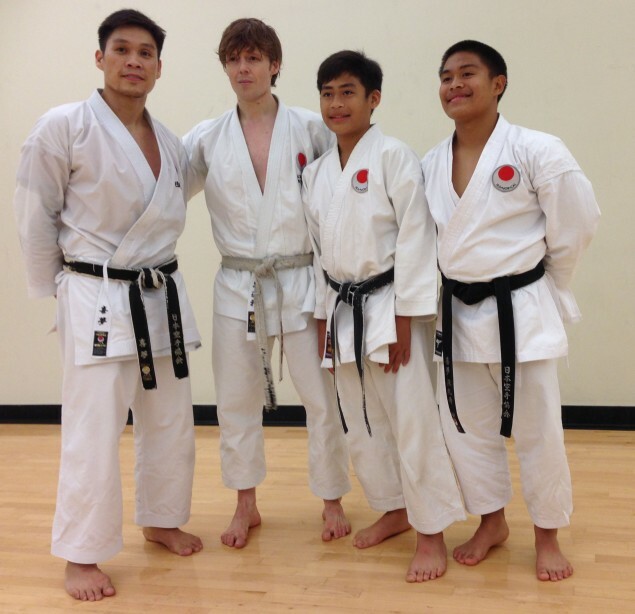 (ALL RANKS CLASS) He began with our typical JKA ground rules, emphasizing the importance of straight lines, good karate etiquette and strong spirit while in training. The first class had a mixture of brown/black belts with a sprinkling of color belts and kids, although lots of focus on Basics – it was plenty challenging. Sensei Shiina asked everyone to be mindful with our punches – make sure to hit with the first 2 knuckles (demonstrating on makiwara), direct our techniques toward our center lifeline and deliver punches with more power using hip vibration. DRILL: Step back rising block reverse punch, step forward oizuki face punch. Then with partner, one side oizuki, the other side steps back age-uke (not toe to toe, opp side) and reverse punch. Progress with more speed. Rotate partners. Sensei called out the 3 techniques in this lesson: (1) Rising block with hips 45 degree; (2) Reverse punch rotating hips to front forward and (3) Step in punch with hip vibration to generate power and end with body forward and hips to front. Point – Gedan berai, hips although 45 degree, the joint is still closed. He had the black belts in the class in deep front stance, slowly tracking hips sideways rotating to hips front faced while concentrating on “closed” joint. DRILL: zig-zag step in punch to targets down the line… many rounds with more speed and more focus. 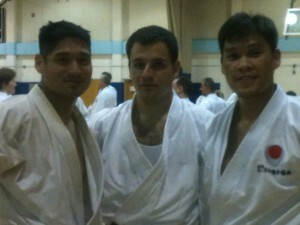 Then he ended the class with Heian Shodan with the same feeling and adrenalin as the zig-zag drill and SPEED! (ADVANCED CLASS) Warm up with kicking. Standing with feet together, right leg front kick (focus on lifting knee) snap back to front stance with right leg back. Next, right leg front kick again (focus on extending hip joint forward) snap back to standing position. Repeat with left leg. Point – lifting knee focus for short distance and extending hip focus on longer distance. DRILL: with partner standing and kicking in place. Other person gedan berai shifting tai sabaki reverse punch. Left hand blocking right leg kick and tai sabaki to the other side right hand blocking left leg kick. Repeat with speed. DRILL: in groups of 3, center person at kamae, steps in punch to ‘front target’ then quickly steps back turning to ‘back target’ to step in punch. Repeat with speed and stretching the distance for the oizuki. DRILL: in groups of 3 at a triangle formation, center person steps in punch to ‘right target’ then back to step in punch toward ‘left target’. Repeat with speed. DRILL: same group of 3 in same formation, center person steps in punch 2 times to each target before moving to other side. Now the target age-uke reverse punch to block and counter on each oizuki. Point – quick step back on transition for each oizuki. DRILL: add on an additional ‘front target. A series of oizuki to ‘right target’ and ‘left target’ (6 times) then gedan to the front for a series of 5 oizuki face, step back age-uke. The target reacts with step back age-uke and step forward oizuki face. The challenge is how to execute on this drill in 7 seconds – impossible! Well that is the benchmark for Japan National Team (of which Shiina Sensei is the Coach for next year’s JKA Funokoshi Cup in Bangkok, Thailand). 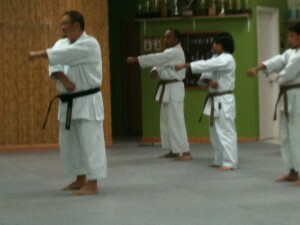 We stretched a little and warmed down the class with Kata (Hangetsu, starting with left side then right side). 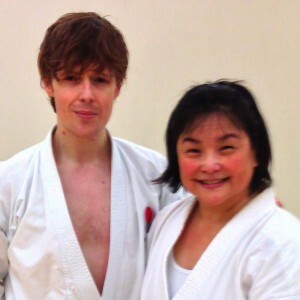 Shiina Sensei says that in karate, we should workout on both the right and left side (balance). He also paused to reflect on JKA’s Sugiura Sensei’s writing (framed on Miami Shotokan’s wall), how when we train, our “body” is kamae, on alert, pumping with high energy and readiness while our “heart” is calm, thoughtful, controlled and deliberate. This in contrast when we perform Hangetsu Kata which is the opposite where our ‘body’ is slow, controlled and deliberate while the ‘heart’ on the inside is beating fast on high alert and anticipation. (ALL RANKS CLASS) Review basic blocking techniques – soto-uke, uchi-uke from standing position, then stepping forward. Point – attention on the course of the blocking beginning from hip down position. Transition to review the blocks in Bassai-Dai. Make sure of proper body contraction and expansion of chest in the beginning series of blocks. Work on slow-mo kata (which is much harder training) then explode to fast and strong. DRILL: from standing position left leg step forward soto-uke, in place uchi-uke, kizami-zuki, kunge gyaku-zuki (maximum reach). Repeat for other side. With partner, modify kizami-zuki to age-uke with a deep reverse punch responding to attacking side’s 4 punches, chudan, chudan, jodan, jodan. 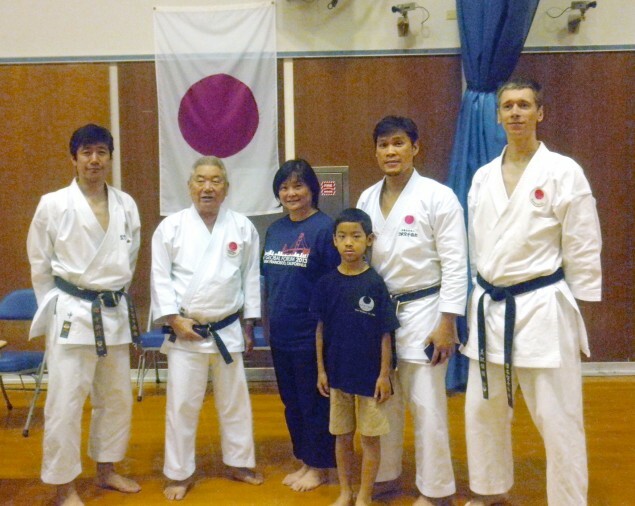 Sensei reviews bunkai for Heian Nidan with color belts and Bassai-Dai with advanced belts. (ADVANCED CLASS) I should have guessed that it would be an intense class when Sensei Shiina took time to sufficiently “warm us up” in the beginning of class. From seiza – knee kicks; from standing – back fist to the back, reverse punch back to standing facing front; a series of tai-sabaki blocks with reverse punch on both sides – age-uke, uchi-uke and lastly gedan-berai with kekomi counter. With SPEED. 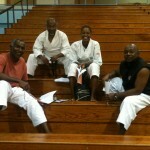 In groups of 4 lines – he checked our brown belt katas (Bassai-Dai, Kanku Dai, Empi and Jion). He pointed out the importance of pivoting on the heel; expansion and contraction of chest and back muscles; and how to set up and explain bunkai for kata. 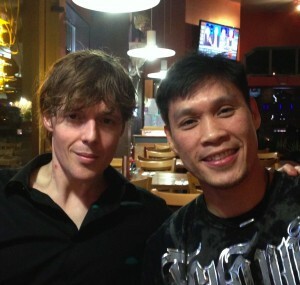 A water break to rest up before donning our sparring gloves. Then, it is a series of “killer” zig-zag drills! LESSONS: (1) we spent a considerable amount of time learning how to ‘set-up’ these zig-zag formations – targets at 45 degree facing, staggering targets at varying strides not just uniform so we make adjustments for distance during the drill; (2) team spirit – the lead in the group charged with keeping the energy and spirits high (keep count, cheer, encouraging … ). I must admit, it did not come natural for us in a drill, at a class situation to feel that kinship/camaraderie. It took Sensei much bellowing in your face “you must talking to your team” to get us hyped up sufficiently to his satisfaction. Hmmm… perhaps we got a glimpse of how they ingrained the envious ‘team spirit’ we see in the japanese team – it is part of their class training. DRILL: kizami-zuki, gyaku-zuki (only 2 slides to reach target) down the line; then with targets slightly further apart – 4 punches 2 steps (kizami-zuki, gyaku-zuki, gyaku-zuki, gyaku-zuki) down the line. Then, he separated the group under 49 years – higher intensity. Next, 40 and under – add more intensity. Building up to the “uber” DRILL: in pairs, one go through the rigor down the zig-zag formation while the other wait at the last tollgate where they meet for an explosion of full blown KUMITE! 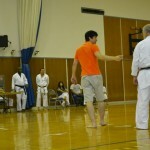 Unbridled, not tournament style, non-stop kumite until Sensei calls for “Yame”. A couple more rounds and then a final add-on to DRILL: after “yame”, immediately ready into 2-wazari tournament style points to complete. 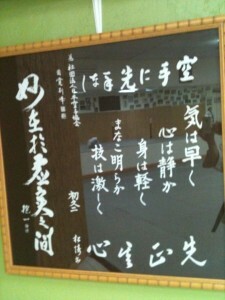 (ALL RANKS CLASS) Standing position, step back down block gyaku-zuki, back to starting. Repeat other side. Next, switch in place, down block gyaku-zuki. With speed. DRILL: variations of one-step sparring – with partner, one side step in oizuki, other side step back age-uke (toe-to-toe), reverse punch. The oizuki person now counters on the reverse punch with tai-sabaki, (1) down block gyaku-zuki. Repeat with speed, 3x for each side; (2) empi elbow block, spinning 180 degree, empi with the other arm to the back of partner. DRILL: In groups of 3 (an “L” formation), 1st person face each other – do the previous (1) drill. Attacker continues at 90 degree turn to face next target – do the (2) drill. Note, targets starts from standing position step back rising block reverse punch. 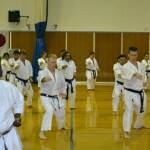 DRILL: In groups of 4 (a square formation), face 1st target (1) down block gyaku zuki, 90 degree turn face 2nd target (2) down block mawashi-geri jodan, and another 90 degree turn to face 3rd target (3) spinning empi to the body. DRILL: In groups of 3 (an “L” formation), face first target (1) empi, 90 degree turn to face 2nd target for (2) full blown kumite. Kumite agility move left, move right, counter. 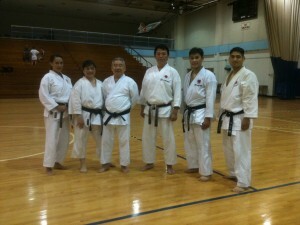 Sensei reviewed Heian Sandan with color belts and Jion with advanced belts. 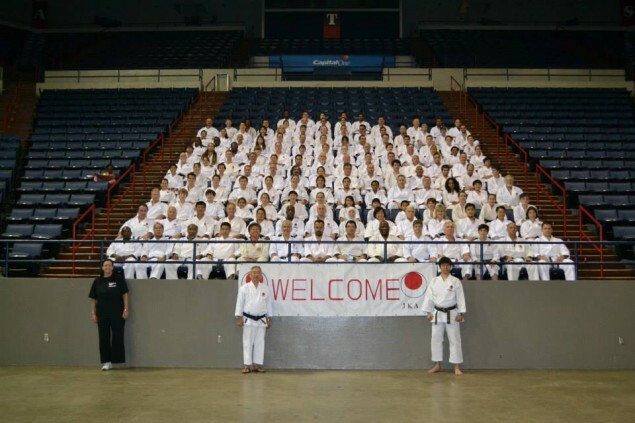 Our seminar was just a sample of JKA AF’s annual national camp in New Orleans last weekend. 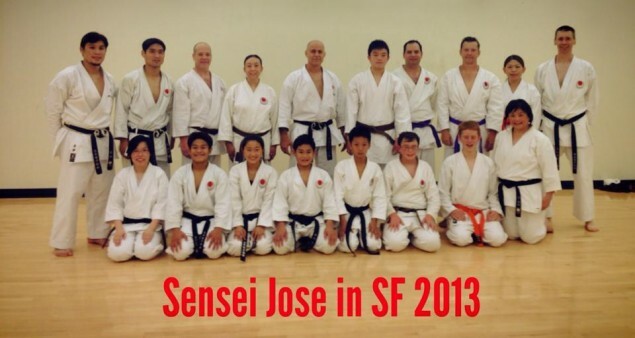 Nonetheless, we are happy to host the Sensei(s) here in the Bay Area and share the good instruction with our fellow karate-kas here in the Northern California. We worked on “Kihon” (Basics), “Kata” (Forms) and “Kumite” (Sparring) techniques. A call out for us to work on keeping our hip position at consistent height level throughout our katas and more attention on “Zanshin” (the perfect finish) in kumite. VENUE: Burlingame, CA (@ Prime Time Athletic Club) Click here for directions. Instructor class in the afternoon ($20*). 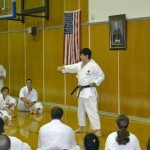 Black belts only but you do not have to be an instructor to attend. This class will instructional based focusing on instructor’s training. * Please pre-register for Saturday classes which will include a day pass to Prime Time Athletic Club ($20 value) your pass will be held at the reception for you. 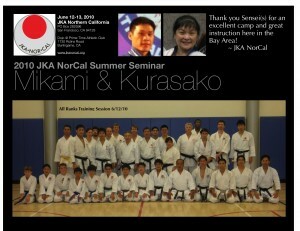 Email info@jkanorcal.org to pre-register. 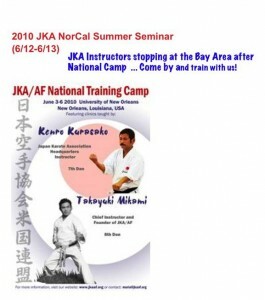 We will email you forms and instructions for you to mail check to our dojo or print out these JKA NorCal Summer Seminar Registration Forms and mail to JKA NorCal to pre-register. 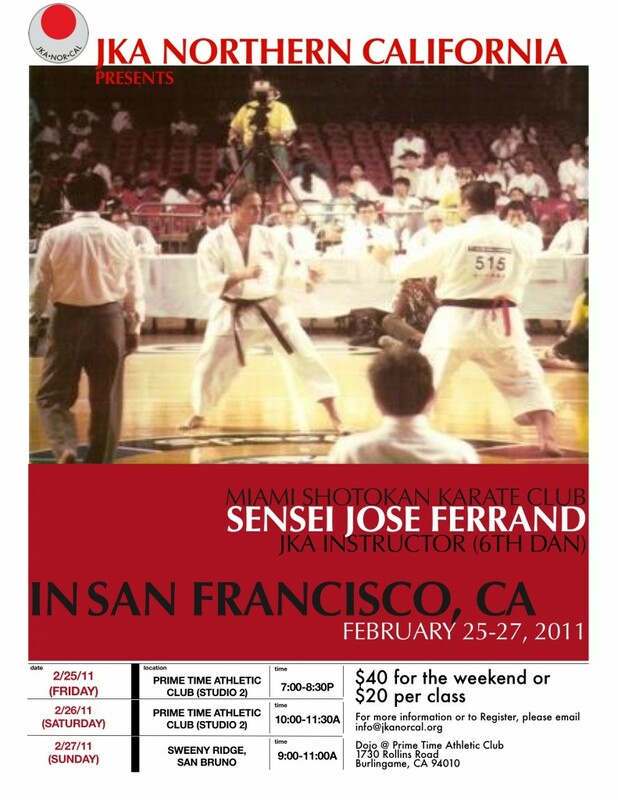 Otherwise, walk-ins on that day you will have to pay for the day pass directly to Prime Time at the reception as well as the seminar fees to JKA NorCal for the classes. Spectators, please pay at the reception $20 for a Prime Time Day Pass to get in. Pre-register for upcoming seminar in June.